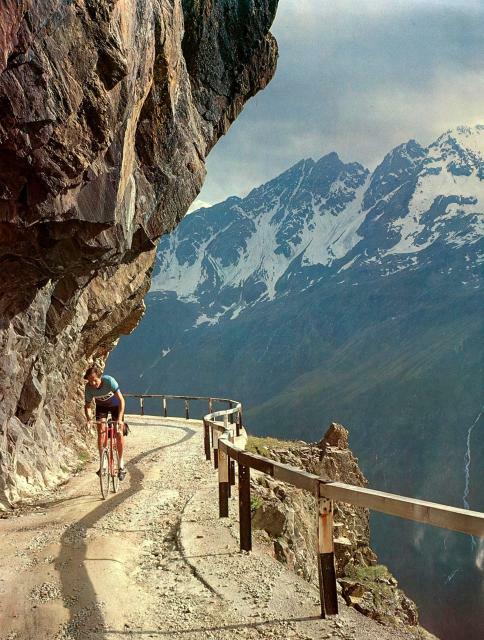 Today the Giro climbs the Passo Gavia as its final act in the mountains. It'll be the Cima Coppi (highest summit) and the last climb of the race. Last chance for Evans and Arroyo to take back time on Basso, who looked a little shaky coming down the Mortirolo today in the rain. Nibali was waiting for him a lot, and he lost about 1 and a half minutes of his advance over to the dropped-but-desperately charging-back Arroyo, only to pull the elastic back out again on the finish climb to Aprica. Today, they'll come up the Gavia from the Bormio side this time (I believe 'opposite' of the way the famous Andy Hampsten-blizzard epic of 1988). No matter, still a killer climb. When I heard they wever coming now this side, I thought of this photo, which I first saw on the cover of the Palo Alto Bicycle Sport mail order catalog back in '77. ...and contrary to popular opinion, they don't fade away either. In fact, they never stop riding. 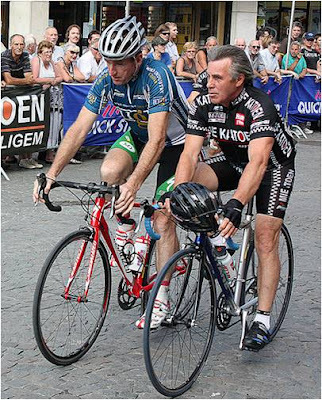 Flandria Cafe topfavorite, the King Sean Kelly with Lucien Van Impe. Van Impe could out-grimp anyone. Whenever I see a polka dot jersey... I think of compact Van Impe with an afro perm, dancing away with souplesse up some impossibly steep pass, leaving Thevenet and Merckx gasping and stomping. Next time you're lugging up a hill in a too-big gear, think of Lucien's soupless, gear down and spin away. Today, Van Impe is sporting director of the Willems Veranda team. In this photo he's wearing the jersey of the wieler cafe 'De Katoen' in Affligem, great place. Is this the best Giro in years? 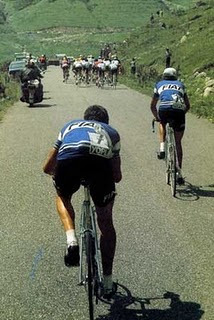 In contrast to the 'Bore-de-California', the Giro GC is getting tossed around every day like a good insalata. Nibali and Basso just came back from their nap on the road to L'Aquila to take two key stages. But Vino, Evans, Sastre and Cunego are far from finished. And Toldo, Porte and Arroyo don't look like lying down without a fight either. The stage to the natural arena that is the top of the Zoncolan yesterday saw Basso shatter the field, with guys wobbling up one at a time. Check out the video of the final k here, and see if you don't agree that the sight of riding up to a summit finish with 140 thousand screaming Italian fans doesn't beat a time trial in blase LA for drama. Who says you can't turn back the clock? Well still-not-so-fast-Eddy took the consolation sprint of guys dropped in the finale of the 45+ race at Lake Sunapee this past Saturday. At least this week I got through about 35 miles or so before getting dropped. My own stupid, should-know-better overgearing on the climbs didn't help... the power left me suddenly on a short sharp acceleration. Lake Sunapee is a fun, classic New England race filled with good memories for me. Back when I started racing it in 1977, it was held in late August and was the 'New England road racing championship'. Saturday's Giro battle over the strada bianchi - the 'white' gravel roads in the back country of Tuscany just shattered the peloton, and provided a great day of racing. Didn't see it? Watch the stage recap here. Primary protagonist and beneficiary on the day, the tough-as-Kasak-yak-hide Alexandre Vinokourov said after the race that those roads were ok for a one day race, but that they really shouldn't be included in the major tours. What's that sound? Oh, that's just Gino Bartali, rolling over in his grave. 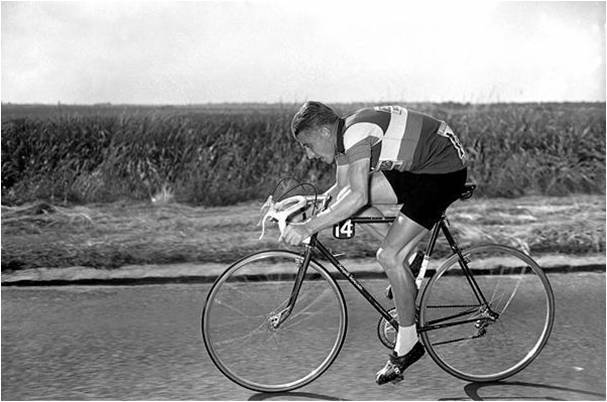 Ginataccio the iron man rode and raced those gravel roads for his daily bread throughout the 30's, 40's and 50's. And you never heard him whining that they didn't belong in the Giro. Tomorrow the Giro leaves the Strada Bianchi of Tuscany and heads to the first of several tough mountain finishes at Terminillo in the Abruzzese Appenines. It's the first day for the mountain goats, a summit arrivo in the terra of a true mountain goat who passed away a few years ago - a rider little known to most English speaking cycling fans - Vito Taccone. Taccone was a compact, powerful climber. Nicknamed the Abruzzo Chamois, he was a Giro great of the early sixties, but an even greater character. Born into poverty in Avezzano, Vito - using the proven Fausto Coppi template - leveraged a job as a bakers' delivery boy into a pro cycling career as a way up, and out. The daily bike deliveries up and down Monte Salivano gave him the conditioning to climb like a goat, but it was his stubborn, belligerent character that made him a true force of nature on the bike. 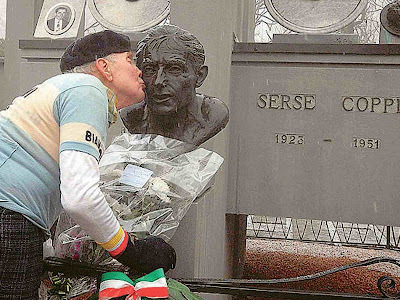 50 years after his death, the Giro paid tribute to Fausto Coppi today by routing today's stage to Novi Ligure that went through his home village of Castellania. Never underestimate the Fausto-worship that lives on in the World War II generation of Italians. He was symbolic of a nations rise from the humiliation and carnage of a lost war. Following him on radio in the papers was a daily diversion at a time when most had little to celebrate - a passion that for some approaches religious zeal. This is not an exaggeration. One crazy weekend at casa Moser. In a little-reported-in-the-English-press footnote to this year's Paris Roubaix, the world got to see the international debut of another rising up-and-comer who won't have much trouble ticking off the 'superior-genetics' box. In the same-day-as-the-pros Junior race, in 36th place just a few minutes out one can find a certain Ignazio Moser riding for the Italian national azzuri. Yup, you got it - the teenage son of 3 time Roubaix champion Francesco Moser. (Check out the results here - there were two Americans in the top ten with Texan Lawson Craddock in 3rd.) Papa Francesco was there at the finish to embrace the latest star from the extended Moser dynasty. As a naturally impatient and thick-headed character, It's taken me about 30 years to realize that cycling is a fickle friend. If you're not careful, it can quickly cloud your perspective, and demotivate you into burying your bike in your backyard... or putting it on ebay. That is, unless you do what's counter-intuitive to most intelligent people, that is just shrug, ignore it, and take the long view. Take my weekend. Saturday I show up at the Sterling Road Race. 48 miles of age 45+ racing. Training since my peloton finish last Sunday? A whopping total of two and a half hours. One interval session, and a short recovery ride. Other than that, a work week filled with a two-day out-of-town conference, a big evening client shin-dig, and lotsa work. A little too much pasta, and a few drinks. Weight? Boom! From 165 to 172. Bad omen. A style masterclass, courtesy of...Maitre Jacques Anquetil, circa 1957. Toes down, keeping pressure on and pulling back throughout the full pedal stroke past the 'dead spot', turning a big gear as steadily as a metronome. Torso solid as a rock, with all the power emanating from the titanic strength of a lower back that never so much as sways. A horizontal and perfectly aerodynamic back, this despite the fact that the stem is only a 1-2cm lower than the saddle. Bent relaxed arms, elbows in. Relaxed hands and wrists pushing ever so slightly against the curve of the bars for more leverage and stability. Eyes fixed on the road 10 meters ahead. Today, I got the monkey off my back. I finally finished a race in the bunch. Let the pigeons loose! The Blue Hills road race was 42 miles on a fast, but not very hard course. 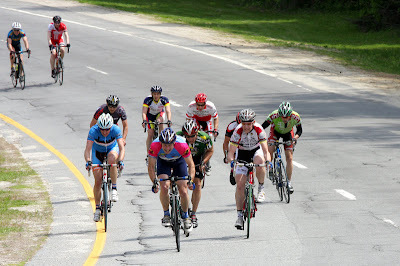 The 7 mile circuit around a nice wooded reservation just outside Boston featured one big ring mile-long climb each lap. It wasn't a very selective climb. I felt better and better as the race went on, was able to mix it up in the action at the sharp end of the bunch during the finale-- even got off the front a bit on the last lap in a small group pulled away by World Masters Time Trial champion Dmitry Buben (a CCB club-mate). Unfortunately, I couldn't uncork a great sprint at the end - still lack the old explosiveness. I ended up only 18th, but hey I'll take it...the front end of the bunch beats getting dropped. Finally started to feel like the old days. 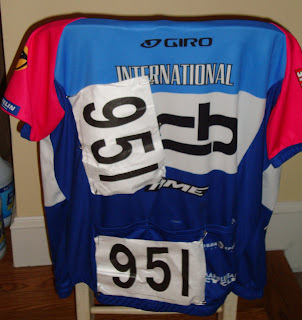 Maybe my race number was a lucky omen. It was 951.